When inspiration strikes you go for the gold, because you don't know when the muses are going to go home. 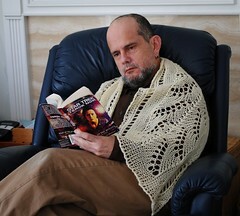 I present you Apollo A Man's Shawl. 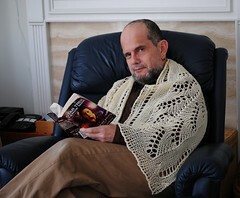 What makes it a Man's Shawl, well nothing really, I made it with a man in mind, a woman may certainly wear it with pride and without hesitation of being discriminated against. It is Lace after all. 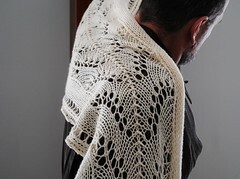 One of the particular things that people don't realize in lace is that lace is a reverse craft, kind of. I make the design to be deformed or blocked , thus when you knit the design it looks very different than when you block it. Well Back to my reading, but before I do. I want to thank Naomi once more for her invaluable help. 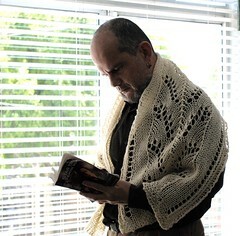 I also want to thank my Ravelry Group and the Men Knitting Retreats for their inspiration. I want to thank the Muses for their kind visit and while they are here I shall continue to design . I have two more patterns in mind, but this time is for women. The Patterns are for sale if you are interested, look for them on the sidebar, Thanks for your support and for stopping by.